Contracting with the government is complicated enough by itself. Throw in the complex rules governing intellectual property and prime/subcontractor relationships, and the legal terrain quickly becomes riddled with pitfalls for the untutored. Martensen IP government contract attorneys routinely address intellectual property issues with respect to government contracts and the interaction between subcontractors and prime contractors. The attorneys at Martensen IP have personal experience with federal contracting and intellectual property law. Said simply, we know your customer. Our team collectively has decades of hands-on experience within the government as warfighters, program managers, and procurement officers. This depth of expertise greatly benefits our clients as they enter into contracts with the federal government. As an additional resource in support of Martensen IP’s government contracting work, Michael Martensen retains the capability of reviewing and analyzing government sensitive information. 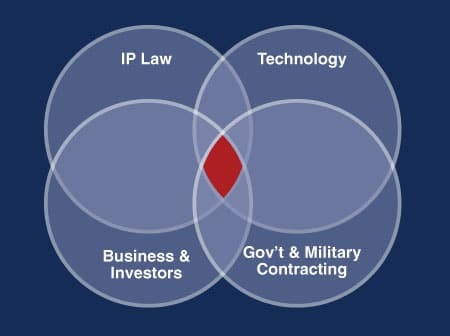 Many clients approaching Martensen IP for legal advice understand that it is not unusual for a federal government contract to result in complex intellectual property issues for the contractor. Making the right decisions early is critical to preserve a company’s value, even when the government is the client’s primary (or only) customer. Martensen IP works with startups, emerging companies, and established organizations seeking to protect and commercialize intellectual property developed in the course of fulfilling these government-funded contracts. The firm also advises clients with respect to the legal requirements involved in characterizing pre-existing products as IP prior to entering into a government contract. Martensen IP ensures that the technology clients have developed for the government remains their property and is available to them for commercial development after and during the fulfillment of the government contract. The laws governing intellectual property for the government and for the commercial sector, while related, are arguably two different systems. We know how to tailor this legal advice to our clients. Big ideas become big successes when they are secured, protected, and put to work.